As a high school student Jordyn Watts ’15 faced a tough question that many students must confront: would she attend the college of her choice or settle for something more financially accessible? Although she was academically well qualified Watts worried that her budget would put Colorado College’s first-rate education opportunities well out of reach. Fortunately, Watts’ destiny changed when she was awarded two scholarships — the Jay D. Cayton ’52 and Betty G. (Saunders) Cayton Endowed Scholarship and The Woman’s Club of Colorado Springs Scholarship. 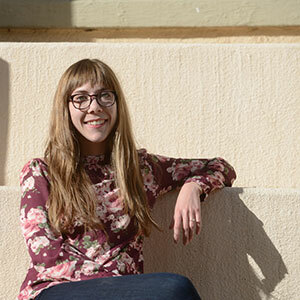 Throughout her ensuing years as an undergraduate, Watts has thrived. She is majoring in neuroscience and minoring in biochemistry and says the research opportunities that she’s encountered will position her well for graduate school. Watts has worked in the lab of Associate Professor Lori Driscoll ’94 with research focusing on behavioral pharmacology. Watts has studied how different compounds influence the nervous system and, ultimately, behavior. Her thesis examines a sub-discipline, behavioral neurotoxicology and she has specifically studied the flame retardant compound polybrominated diphenyl ethers (PBDEs). She will ultimately pursue a Ph.D. in behavioral neuroscience. Half a world away from Colorado Springs in New Zealand, Peggy Cayton talks eagerly about her late parents, Jay ’52 and Betty Cayton — and Jordyn Watts ’15. The common thread that links Peggy, her parents, and Jordyn is the Jay D. Cayton, 1952 and Betty G. (Saunders) Cayton Endowed Scholarship, which Jordyn was awarded when she enrolled at CC in 2011. Peggy’s father, Jay, grew up in a single-parent home during the depression and money was scarce. Later in life, when Jay was a student at Colorado College, he was helped by many people in the Colorado Springs community. Assistance from others and a lifelong appreciation for education that he shared with his wife, Betty, led to the couple’s decision to establish a scholarship. After completing his bachelor’s in zoology at Colorado College, Jay held a number of positions including managing a construction company, owning a hardware store, and for 20 years serving as principal of a Northglenn primary school. A park adjoining the school bears his name. Betty was a homemaker until 1963 when she decided to take a step outside the norm and challenged herself to obtain a bachelor’s degree from the University of Colorado, Denver. She served as a teacher at Northglenn for 15 years. Peggy and Jordyn have had the opportunity to meet with one another and they talked about Jay and Betty. Peggy gave Jordyn Watts pictures of her parents, biographical information, and told her about their passion for education in Colorado. Coincidentally, Jay and Betty Cayton attended Colorado Springs High School, which today is Palmer High School — the same school Watts attended. “I was honored to receive the Cayton Scholarship, particularly after meeting Peggy and learning more about the legacy her parents are passing down to Colorado College students,” Watts says.